First Line: "Two fears have plagued me from the time I was little, and today I must face one of them." Review: Wilamena "Wil" puts all her faith in the stars. Her mom was an astrologer and to carry on her legacy Wil is dedicated to following in her footsteps. She lets the stars guide her way in life including her love life right down to the sign that should be her soulmate, when she finds out she has a limited amount of days to find her soulmate or wait for another decade she goes on a mission to find him, and that is where things go all screwy in her life. 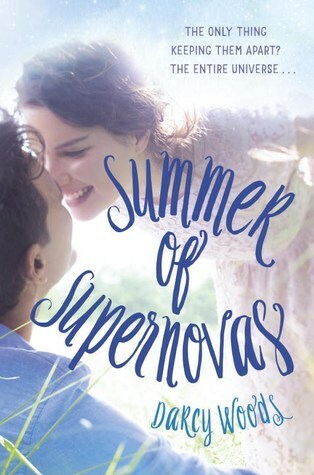 I found Summer of Supernovas to be a cute and fun read with lots of humourous moments. Yes there are two guys and it becomes a love triangle but I loved it, I was a little skeptical going in because me and love triangles usually don't mesh well together but it really didn't bother me at all. There are two brothers Seth and Grant, one is her perfect match according to the stars and the other one will bring her to ruin. So why does she have these intense feelings for the one she should run in the complete other direction from. It was fun to see Wil grow as a character, the main plot obviously had to do with the romance but there was more to it, Wil had a lot of inner conflicts. Even though her mom died when she was quite young you can tell the astrology thing was more so her just trying to hold on to her mom and sadly it became a little unhealthy when it started to interfere with her own happiness. As for Seth and Grant, I fell for Grant hard! Seth is a little bit more complicated and I really liked him too but a few things happened that made me love Grant more and more. Not to mention the chemistry between Wil and Grant were off the charts. I did find the story to be a bit cliche and predictable but it didn't take away from my enjoyment of the book especially when I was really in the mood for a light fun summer read. ~"Sometimes life requires a leap of faith."